Some Polish chauvinists remain extremely hostile towards the Ukrainian people for the past "sins" of our ancestors. They reproach us for "Haydamachyna", "Bul'bivshchyna", "Khmel'nichyna". But Zal'iznyak, Honta, Krivon'ys, Bul'ba, and Khmel'nitskyj did not appear out of nowhere and start slashing "Lyakhs'" throats. They did not do this on Polish soil, but on their own, driven to despair by the Polish nobility. This would probably not have happened in Uman, had the Polish gentry and the Jews not taken away the keys to Ukrainian religious temples. In no other country did Christian people experience such humiliation and shame - where it was up to "Pan" (Sir) Zelman's discretion, whether to allow the Ukrainian serf to pray on Sunday, while the Ukrainian serf toiled in the fields of his native soil, on a holiday, under the foreman's whip. There would have been no "Khmelnichyna" had the Polish gentry treated Ukrainians as people instead of "scum" or "stinking cattle". Bohdan Khmelnytskyj, who would later become the "hetman" (head) of the "Zaporozhian" army 2 lived in such a world. As a witness to the frightful injustices being done to his people, he vowed to liberate his native soil from the oppressors. No leader ever takes pity on a mortal enemy, and Bohdan was no exception, although he was not able to avenge all the injustices done to his people. Khmelnytskyj remains the national hero of our people, a symbol of freedom to which all enslaved masses aspire. Every occupation, whatever its nature, sooner or later ends with the victory of the enslaved masses. Bohdan, in his rebellion was joined by the Lemko outlaws under the leadership of Vasil Chepets from Hrybiv, Bayus, and Andryj Savka. Andryj Savka together with the Polish insurgent Kostka Napyerski incited the peasantry in the Western Carpathian Mountains, and lead them in an uprising against the Polish nobility. Only the defeat of Khmelnytskyj's army near Berestechko helped the gentry "take care" of the rebellious peasantry. 1 Lyakhy - ancient Polish name for Poles, based on a legend about three brothers, whose names were Lekh, Chekh and Rus. All three went in different directions and founded the countries of Poland populated by Lyakhy, another country populated by Chekhs, and the Kyivian Rus'. Lyakhy is considered to be a derogatory term, but only if used by Ukrainians. 2 "Zaporozhian army" may be historically inaccurate. 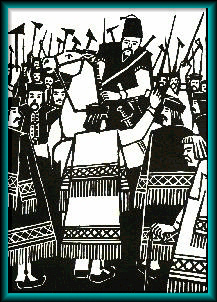 Even though Khmel'nyts'kyj started his uprising from Zaporozhian Sich, his "Kozak" army consisted of "registered", unregistered" and Zaporozhian Cossacks as well as thousands of former serfs. Eventually he became known as hetman of the "Cossack State", rather than "Zaporozhian army".